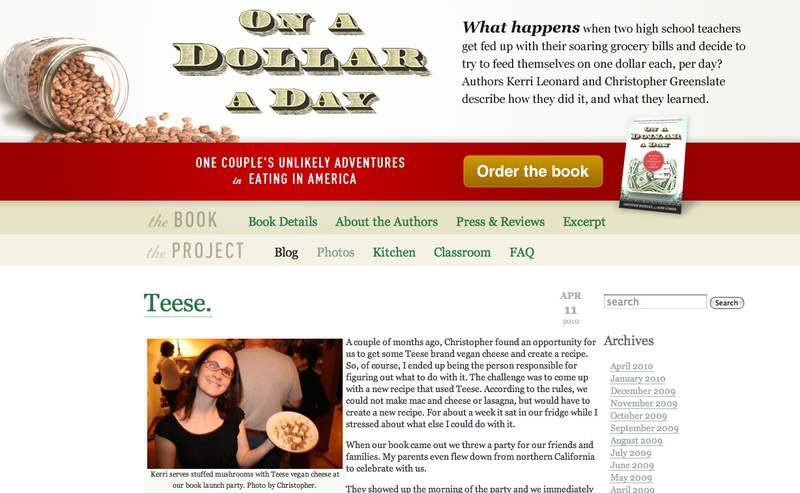 In addition to our most recent happenings, you will find lesson plans, quizzes, recipes and more at the new site, like Kerri’s most recent cooking experiment with Teese brand vegan cheese! So from now on, we’ll catch up with you at the new site! An article that features us, and comments on our experiment as part of an analysis on deprivation experiments has been published in this week’s TIME Magazine. Here’s a link! By the way, if you haven’t already, please pick up a copy of our new book “On a Dollar a Day: One Couple’s Unlikely Adventure in Eating in America”…you can click to order on the right hand side of this page! 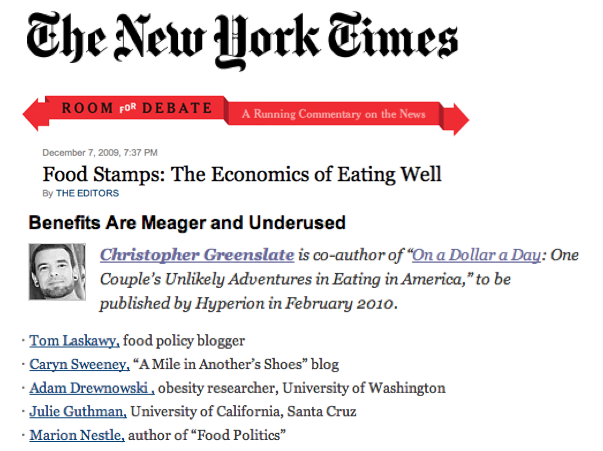 A recent article about food stamps in the New York Times created a flurry of fascinating comments on the New York Times website last week, and to further the discussion, the opinion editors asked six different people to contribute a piece for their “Room For Debate” section. The piece itself was supposed to be limited to 250 words, making it difficult to choose what to write about (we devoted a whole section to food stamps in our book). So I chose to focus mainly on the challenges that people in our area face, and to mildly ignore the word count restriction by about a hundred words. I figured that other writers would say many of the things that I wanted to (which they did), and thus decided to write about something that none of them would: San Diego. Please take a minute to read all of the entries. It is an honor to have my voice next to political food legend Marion Nestle, and I hope that you’ll enjoy the discussion. Award for Best World Food Day message goes to Silverman. Yesterday was World Food Day, a day to mark the establishment of the Food and Agriculture Organization at the United Nations. This organization was established on October 16, 1945 and its purpose is to make sure that the world gets adequately fed, but their latest report reeks of failures. While we would have loved to have been in Rome to hear the 6th Annual George McGovern World Food Day lecture by Marion Nestle, we were busy teaching high schoolers. And while we weren’t there, we feel good knowing that her comments about the solutions to hunger lie squarely in the social sphere, not the tech-world. While Bill Gates, who also spoke this week (at the World Food Prize forum), firmly believes that developments in technology (mainly transgenic plants and fertilizers) will play a major role in solving hunger issues, he misdirects his frustrations by blaming environmentalists. He’s correct in asserting that technology has a role to play, but the inability of poor farmers to grow crops is only a small part of the problem facing those starving in the third world. If you want to point fingers, environmentalists are minor and largely irrelevant target. I recommend starting with someone bigger, maybe the World Bank? For all the hype about the development of new tech-crops, like those of the Norman Borlaug’s Green Revolution in the 70s, which produced high-yield rice and wheat (and won him a Nobel prize), we already know what solves hunger: Breastfeeding, clean water and safe food, empowerment of women, education, community food security, sustainable agriculture, and political stability. The technology Gates is talking about has yet to solve such problems, and probably never will (although, I’m open to it!). However, amidst all the passionate calls to end hunger, there was one voice that definitely stood out, and it wasn’t that of Pope Benedict the XVI. While the Pope called for “determined and effective” action from Rome on World Hunger Day, and said that, “Access to food is more than a basic need, it is a fundamental right of individuals and peoples,” his own organization has the money to meet many of these needs and could do more. Even Jesus told his followers to sell what they had and give it to the poor. While the Catholic Church and its thousands of charities across the globe are known for their dedication to the poor, it’s hard for folks like Sarah Silverman to take the Pope seriously when he has a palace to sleep in. Maybe this is why Silverman decided to call him out. Even though selling the Vatican wouldn’t be enough, it would be helpful. While the Web site Slashfood.com has recently ranked their “Top 10 Most Awesome Food Mascots,” (the Jolly Green Giant should have been #1), we are giving our own award, and it goes to Sarah Silverman for “Best World Food Day” message of 2009. While many will find her message crude, she has a point: If we say we care, we need to ante up. Which is why I have decided to take Peter Singer’s challenge from his latest book “The Life You Can Save” and give a percentage of my income each month to groups working on these issues. It’s not the only thing I plan to do, but it is one that is vital. To the pope: Do it, sell the Vatican, and feed the 1 billion people who need it. It’s just a building. Taxing the Children of the Corn? A report released earlier in the week suggests taxing unhealthy foods to help combat obesity. Our time with Kerri’s family at Donner Lake is quickly coming to an end, and as we continue working on the last few chapters of the book, I have found my urges to eat food-like products such as Oreos and Wheat Thins stronger than ever. This week has been a battle. I took a vow two weeks ago to not eat prepackaged cookies anymore, but a week ago, I caved. I returned home from my fellowship at Cal Poly and found a small Ziploc bag containing some Nutter Butters in the cupboard. I inhaled them. My mind shut down, and I could not help myself. So this week, we have been in an environment flush with processed foods that we would never bring into our home, and the challenge continued. During the dollar diet we could not afford foods like Triscuits or Lay’s Potato Chips. During our last experiment they were not part of the menu, so we didn’t eat them. Our most recent eating endeavor has sidelined these same products as well, but I am struggling now more than ever. In order to help me understand what is happening in my brain when I see things like packaged cookies, I picked up a copy of Dr. David Kessler’s book “The End of Overeating: Taking Control of the Insatiable American Appetite.” Dr. Kessler, who in addition to having been the dean of the Yale medical school, was also the commissioner of the FDA under George H.W. Bush and Bill Clinton. His writing about why we overeat, the role of food companies, and how we can take control of our urges was both insightful and engaging. However, in addition to personal responsibility, there are several other things that need to be done to help our country drop the extra weight. The majority of the comments were of this ilk, and there were 720 of them in the last 24 hours. Now, I do not want any new taxes either, but for those who oppose it, either on grounds of a “no new taxes!” chant, or “no more government!” please give your elected officials some new ideas that will help us figure out how our country is going to have a healthy population and workforce (over 20 serious diseases are related to obesity, including colon cancer), how we are going to stem exponential health care costs (that we are already paying for through current taxes), and how are we going to change the food system so that it will both satisfy and become sustainable? This report, if you read it, is quite well done. However, I suggest that before we start taxing certain products, we should eliminate subsidies for both corn and soy farmers, thus letting products made from these ingredients (which is basically every processed food) take on their true cost. Costs of these products would inevitably rise, reducing consumption, and the money currently used for subsidies could be redirected to any number of avenues to help us combat obesity: health care, education about eating, etc. Unless you have a better idea about how to change things, keep thinking, and keep quiet. PS. If you are curious about our feelings concerning the recent report released about organic food, we align ourselves with Marion Nestle’s most recent post. A Farmers Market for Everyone. For most people who receive food assistance from the government, shopping at a farmers market is out of the question. However, in City Heights, a low-income community in San Diego, the International Rescue Committee and the Farm Bureau have worked together to provide everyone with the chance to shop for local produce. Photo by Kerri. On Saturday morning, Christopher and I took a trip outside of our usual range of travel. We went to City Heights, a community within San Diego, to learn about their farmers market. Right away it was apparent that this farmers market differed from the one we are used to visiting. Ours is held at a local elementary school and has a wide variety of vendors and booths. In addition to fresh produce, you can purchase everything from crafts to fresh breads, and there is usually someone playing live music to the legions of locavores. The City Heights farmers market is located on a blocked off street between a police station and low income housing. There are significantly fewer vendors (this market is relatively new), and there weren’t many customers. However, as we walked past the booths we saw fresh greens stacked up and boxes of vegetables. One vendor had long, slender, vibrant purple eggplants and dark green zucchinis at least a foot long. I made a quick note to stop at that booth with the curly green kale for $1. What I first thought was a place for bike parking was group of young punk rock volunteers teaching people how to re-build and repair bikes. But that is not why we went. Electronic Benefits Transfer, or EBT cards are swiped in exchange for tokens that can be used at any time at the farmers market. It is rare to even find a farmers market in a low income area, let alone one that accepts EBT. In addition to helping people who already receive benefits, The San Diego chapter of the International Rescue Committee (IRC) has volunteers helping to prescreen people to find out if they qualify for the Supplemental Nutrition Assistance Program (SNAP), formerly known as food stamps, and to help them fill out the initial paperwork. They have volunteers who speak Spanish, Vietnamese and Somali. This market is a joint effort between the IRC and the San Diego Farm Bureau which is also starting similar projects in two other areas. According to a volunteer with the IRC, San Diego County is the worst in the nation for food stamp participation. This means that people who qualify are not receiving assistance for a variety of reasons. City Heights has the lowest participation rate in San Diego. This was one of the busiest booths at the time we arrived. We waited in line to talk to someone. While we were there, an older woman came up to find out what was going on and learned that she might qualify for a one time senior voucher. A Somalian man was assisted by two women, one of whom helped to translate. No one was turned away as the volunteers explained the processes and helped people with their questions. While we waited we noticed a survey on poster paper asking customers how the market’s prices compared to those at the grocery store. Most of the feedback indicated that the prices were “similar” or “better.” When we spoke with two of the workers, one from the Farm Bureau and one from the IRC, we learned that they do survey’s every week to better serve their customers and vendors. This particular market is able to offer “Fresh Funds.” Money is donated towards the program and is distributed each week, so that people who spent $5 at the market get an additional $5 worth of tokens to spend there. This encourages people to use their money on fresh fruits and vegetables and helps local farmers. If you live near City Heights or another farmers market that accepts EBT and/or WIC, check them out and support their efforts. The City Heights farmers market Web page has great information about their programs and why it is beneficial to support community efforts that provide healthy food to all people regardless of income.